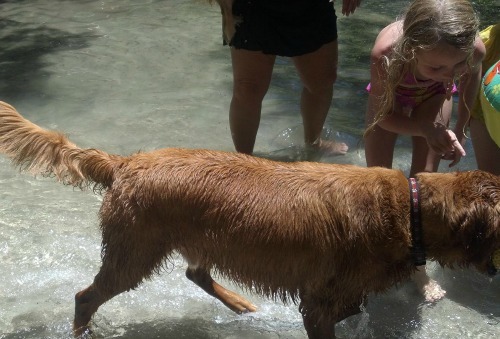 Now picture me in this scenario last weekend: my nature-loving camping-going friend Barbara invites me and my dog Winston to Wekiva Falls to spend the day on the river. I go to the beach all the time. How different can this be, right? I figured it out the minute we turned off the highway onto the old bumpy road that this wasn’t the same. After we parked, Barbara suggests we take the dogs (she had two of her own plus I have the Stink Monster) for a walk to get their excitement out before we make camp. We take a short walk down to the part where the river gets deeper and they rent canoes. We let our dogs go in for a quick swim and within 10 minutes, I heard this loud CROAK noise. Barb says, “All the fur faces out of the water. That was a gator.” What the huh? Alrighty then … I’m in Florida. I get it. We see gators all over the place. I’m OK with that but I give Winston a strong pull to get him out quickly. On the walk back to our spot in the river, my friend cautions me to keep Winston away from this huge water tunnel that dumps into the river. Any reason why I ask? Snakes. Apparently there are snakes that hide in the water tunnel. The last time she was here, some kids tried to climb into the tunnel and jumped out screaming when they saw all the snakes inside. Are you freaking kidding me? You couldn’t have told me this when you invited me to go? I am terrified of snakes. That scene in Indiana Jones is my worst nightmare. Upon hearing this bit of news, my heart starts racing. My stuff is still in the car. Bet I can come up with some excuse and go home. Other than I’m scared, uncomfortable and about a mile away from the walls of my comfort zone. My internal debate didn’t last long. I looked for my friend and she was already in the river setting up our chairs. 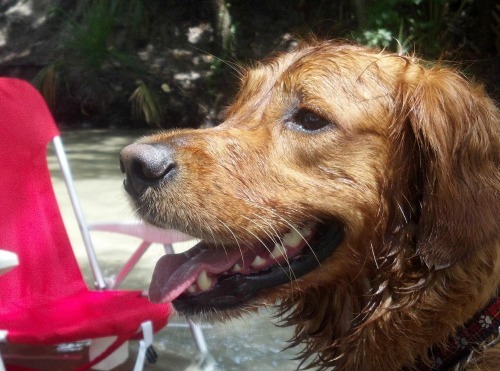 Too late to back out now … river adventure, here I come! I surveyed the situation. I saw tons of people hanging out on the river. Kids floated by on rafts, folks grilling burgers on the river bank and really loud music coming from somewhere that I can’t quite see. There’s so much going on – kids, dogs, people everywhere – and I know that there’s too much chaos for the gators to come down to this part of the river. 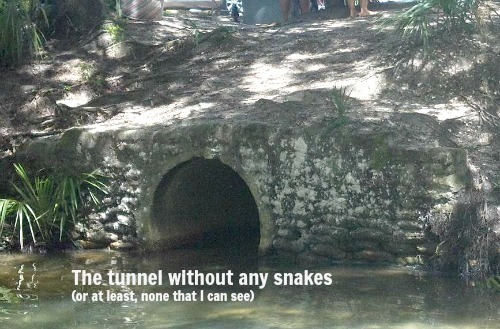 And the noise from all the kids was probably scaring the snakes to stay in the tunnel. I think I’m OK with this. I think I can handle this. I settle in for a day of people watching and keeping an eye on that tunnel. When I looked to my left, I figured out where the loud music was coming from. At the end was a main pool area with a live deejay playing music. 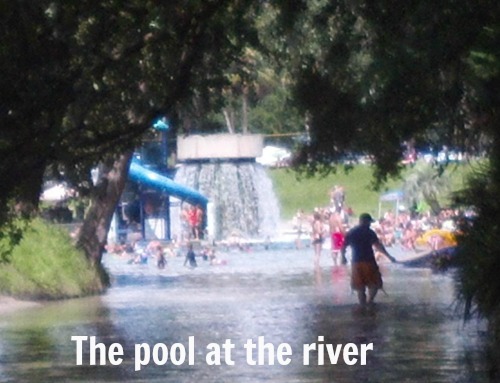 There were slides, large fountains and kids, lots and lots of kids. 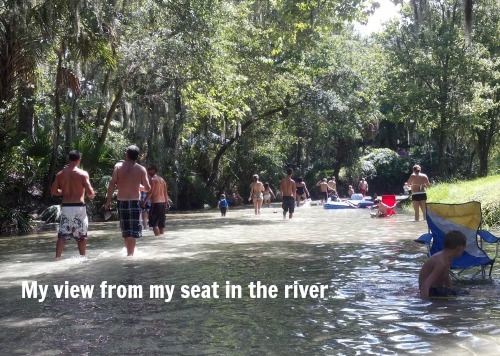 All day we sat in the Wekiva river. The water was unusually cool for a humid Florida day. It was clear and not the least bit murky. I learned that we were sitting in a tributary that flowed from a natural spring and that’s why the water felt so clean. Winston had a blast. He made a golden retriever friend and they chased the ball together. Of course, all the kids wanted to pet him so he played for awhile with them while I looked on like a proud mom. And then out of no where, I heard the deejay play the Hokey Pokey. Almost everyone stopped what they were doing and put their left hand in, took it back out and then they all shook it all about. I had to laugh. I mean one of those obnoxious laughs where people look at me because I was so loud. I sat there, laughing in that river and wondering why I had made such a big deal out of being here. I have a bad habit of making things worse in my head than they really are in reality. If I had listened to the words in my head, I would have missed out on a fun on the river. I would have missed the the hokey pokey and a chance to turn myself around … because that’s what it’s all about. NIce post – well done. Good for you for overcoming your fear and sticking both feet in. Thanks! Some days, I can talk myself out of anything but I figured, what could happen with all these people here? Yeah, the snakes/gators could get the others first. We are two evil people. I blame you. Excellent write! Perhaps you should step outside your comfort zone more often. well hello there Miss Judi! Long time, no talk/write to! Thanks for the comments – think that Patricia would like this one? Hope you’re doing well and keeping yourself cool with this crazy summer heat. My schedule’s pretty busy these days so I’m not sure when I’ll be back to writing class. I do miss everyone and our weekly classes!! BRAVO BRAVO!!!! First off the format of the article is PERFECT!!! Second… SNAKES and ALLIGATORS… NO your not over reacting, I think Barb did not explain where you were going and NATURALLY you filled in the gaps!!! LOVE THIS LOVE YOU LOVE LOVE LOVE!!! Have a great weekend! You don’t know Barb, she’s so use to that stuff that she doesn’t even think about it as a problem. I just don’t think she realized how terrified I am of snakes. Oh I want to go there! Love your title…so funny. Glad you overcame. I’m guilty of the same “expecting the worst” thing. That’s a Buffett song – check it out on youtube, its a good one that not a lot of people know about. Unless you’re a parrothead. Yeah, its a bad habit I’m trying to break. Staying there and not leaving was like baby steps. « Awww .. Ain’t that sweet?